None of them can learn calm mind though And Moltres can't learn blast burn either. these teams are amazing!!! Keep it up guys! Heartgold version team. 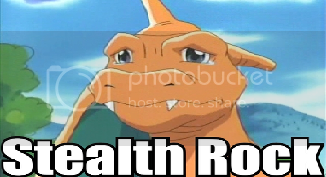 I have access to white, heartgold, platinum versions. Arcanine is the ultimate pokemon, fast and high spec/phys attack the low defense is countered by the extreme attack so crunch is a must for the flinch rate that arcanine can exploit. extremespeed is an option that is completely possible as heart scales are commonly found in the sinnoh underground[platinum]. Arcanine is a beast but I got the wrong ability [flash fire is better for 2vs2]. The moveset is generic only level-up moves here so I would need some TMs in the mix here. [flamethrower, sunny day] or relearner moves [extremespeed, flamethrower]. Donphan's good Attack is constantly used here [every attack is physical] the reason for rock slide is if a glaceon or lapras or jynx got through to here. I wouldn't want that to be the end of Donphan. His largely custom move set is better for fire/electric types. feel free to suggest TM moves. I would rather not use a any TM/HM move cheat but I have the 99 TM cheat active. Ambipom's pickup comes in handy when fling is a 'last resort' no pun intended. Can Ambipom learn recycle? that would be great because the iron ball is the only decent fling item in the bag and I would rather not throw away plates. Ambipom is the scout. Typhlosion is my split moveset pokemon [Fight,Fire,Ghost]. his moveset can be changed any which way except for flamethrower. If you played through without Ampharos you played a suckish game of pokemon. Thunder may not be accurate but due to Ampharos' High Sp.Atk if it gets a hit off you're dead D-E-A-D dead! Charge beam is for Sp. Atk boosts! yes six charge beams = death machine. Okay, a few friends and I are holding small tournament. We're limiting it to no legends and only generations 1 and 2 so I'm using Heart Gold. I've got partial access to DPP but not RSE. The team is mainly for a good time, slight trolling but I also wanna win. The team is still partially in the making, but it's done for the most part. I have little to no competitive experience though, so be as hard as you possibly can on me. I know going a special route with a Rhydon is most likely a TERRIBLE idea, but I wanted to test it out. Just as well, it'll help to survive a grass or water attack as well as deliver a strong fire or electric attack back. I'm also hoping for it mainly to be a shocker since I usually run straight sweepers, but that's more on a personal level. The main purpose of this Rhydon is not only to to tank out, but still eat a special hit or two as well. It may not have Special stats as high as Physical ones, but they could definitely have used a boost in this make. Also, probably not the best choice, but battling amongst friends I wanted to use my favorite Flying-type. I can't say I expect it to live long, but I do have hope that it'll help to deliver some strong critical blows. Again, it'll also come off as a surprise due to the fact that i can't really see anyone even wanting to run a Farfetch'd. It's moveset is giving me trouble though, seeing as it can't learn Focus Energy but I tried to make do with what it's compatible with. I primarily only picked this up to run through the game, but it grew on me. I mainly want it to be a Physical Sweeper, however I Psychic will still it a rough time. I also can't find a Dark, Bug or Ghost-type attack to give it in order to beat Psychics. So far though, this Poliwrath has done more for me than most other Water-types I've used. Yes, the infamous Scizor. I thought the team needed a good beater incase Rhydon was a fail. With Swords Dance, plus Technician I'm also hoping that it'll cause a good with it's attacks too. I know X-Scissor is stronger, but Bug Bite should equal up to the same amount of base damage with the added ability of eating their berries (if my math is right). Obviously its built for Physical attack and I tried to give it a speed boost as well. I'm just hoping it can pick up the slack for my more lacking pokemon. Jynx is going for stereotypical Special Sweeper. I originally wanted to go for a Perish Song strategy, but I didn't feel like it was reliable enough. My only problem with it (that i can see) is choosing between Shadow Ball and Focus Blast. I want to be able to nullify weaknesses, but the low accuracy of Focus Blast makes me a bit intimidated for the loss at the cost of missing. I wanted Charizard to be a Mixed Sweeper but for lack of items, I settled for the Choice Scarf. I know I can do better, but with one file it's tough to find something else other than Charcoal to made up the dent. Just as well, I don't know whether to keep Air Slash for the STAB or Dragon Pulse as a way to take out Dragons. Poliwrath and Jynx can take them out, but as a precaution in case they get taken out it coudln't hurt to have a plan C.
I used to frown at Dragon Rage, but I realize its effectiveness at low levels (<35) now and I like knowing that no matter what I will always do damage! Draco is used as a finisher pokemon, and, due to his ability to use Dragon Rage effectively and wide range of moves, usually starts off in a batte. Future HM slave. I use Rocky mostly as an annoyer, mainly because of Sandstorm and the high Defense stat. 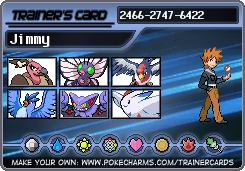 Helps counter the electric type, since I dont have the full-out type immunity team like I do in Black, but thats about it. Harvester is used as a combo of a tank and an annoyer. Curse gets pretty effective when I use it, espescially when I faced Chuck. He would always spam Double Team, so I Cursed him immediately. I usually use her as a last resort, because I'm just cool with her out, until a dark move is used, then I'm like FUUUUU--. Blaze is another combo, between sweeper and tank. I dont really have much else to say about him, other than Yay! Quilava! 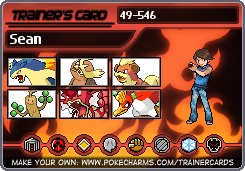 While looking for a Farfetch'd to use as an HM slave, I decided to use my beloved Fearow for Fly and Blaze for Cut. Kenya does great as a Sweeper, and now that I look at the stats, I see why. Red serves as a tank. And yes, its the Red Gyarados! Truth be told, I didn't know all that went into putting together a team... I played through RBY/GSC when they first came out as a kid with no idea what really made a great team. Being older now I want to make one hellava team, if only for bragging rights against my friend... So I seek the advice of more experienced trainers. Pidgeot - NO ITEM Chesto Berry for Rest? Double Team Rain Dance for Thunder / Iron Tail? Victreebel - NO ITEM Since you have 2 Grass moves, why not Miracle Seed? It doesn't seem right to make people take a test so they can make a comment about someone's team. Someone might have one little thing to say about someone's team or just want to comment on one person's team, but the test is there. Also, if you're in need of raters, wouldn't you rather some people can rate each others' teams instead of everyone posting teams and none of them getting rated? Blargaflarga! Try goin in with Swampy, Hera, and Salamency! I would have like to have it be more of a fire team, but I didn't want to reuse Pokémon from older games. I try not to do that unless I didn't use it in the game (I used Arcanine in Gold because I didn't get one in LeafGreen). Like a few (if not all) of my other teams, many of the attacks are there only because I couldn't figure out what else to put. So any advice is more than welcome. I know nothing about natures and... basically I only know a little about the moves, and that's it.